CyborgAeon: You are correct, except I melded the SB and MB board so I would not clutter the page. Ravenous Slime gets swapped in and out based on whether or not I will be facing a hulk deck. I would really like to hear about your test games, outside of myself I haven't actually had anybody say they've tried the deck. Something I am really eager to see, but I digress. 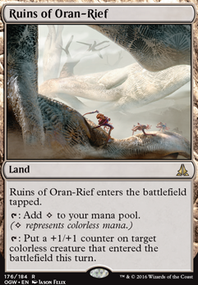 I tried Strip Mine / Wasteland , but at 31 lands, I barely make it to 4 lands before I start popping off by other means, so saccing a land really hurts my curve, since every land I get almost always needs to be used for mana. 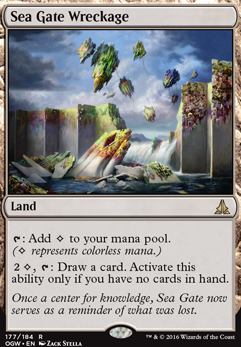 Sea Gate Wreckage : I've always loved this card, but achieving hellbent on this deck usually means I have won, or the game is about to end. 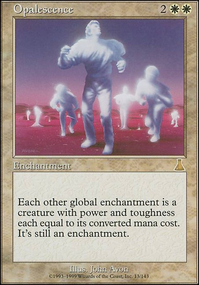 I've always loved cards that do something while nothing is happening, but my meta has removed these breather moments, so I never get value out of fun cards like this and Scrying Sheets . In all honesty though, I would run them if it wasn't for the cutthroat nature of my current meta. Isolated Watchtower : This is something I might try, since it isn't as intrusive and I do have a Lord Windgrace deck running rampant in my pod right now. Thanks a lot for this one. As for the fetches, yes, it's for the shuffling and for Dryad Arbor , which is great in situations where I need to Skullclamp something, Natural Order / Eldritch Evolution , get more out of Regal Force / Gaea's Cradle / Great Oak Guardian . I am also aware that deck thinning is more or less a myth, but in a deck that runs 31 lands, knowing one will eliminate the possibility of drawing another is a blessing in a combo deck (my 2 cents). I wanted to thank you for taking the time to look at my deck, words cannot describe how much I appreciate it and thanks for the awesome card suggestions! Nice list. Why do you not use Sea Gate Wreckage ? Okay so after play testing your deck against my friend's human deck I've got some more suggestions. I don't think the Mind Stone and Sea Gate Wreckage are necessary. With this being a colorless deck, the mind stone is really only there for card draw, and there's better card draw ie Endbringer albeit a little bit slower and mid-late game. Though maybe I'm wrong in that aspect, as the biggest problem I have with my deck is it runs out of steam and then I rely on top-decking. Ratchet Bomb and Oblivion Stone are essentially doing the same thing here, but either one can be better than the other in certain situations. Ratchet Bomb does great against tokens/other 0 cost cards and even against 1, 2, and 3 cost mana caps AND doesn't particularly hurt you much because all of your high cost creatures. Ratchet bomb can just be a little slow. As for oblivion stone, it's better for you IF you can get fate counters on all the biggies you want to protect. Of course, you could just protect one biggie (or none if you have an Ulamog). I know you can just clear the board, and save one biggie. But I've found that Ratchet Bomb and Oblivion Stone play an important role, just not in every situation. Maybe consider sideboarding one or the other? I used to run Conduit of Ruin for the tutor, but I hated how slow it was and that the Conduit quickly became a target because of the discount. It's not a bad card, but I think you have enough big bois that you don't necessarily NEED to tutor for them. Which brings me to my final point. 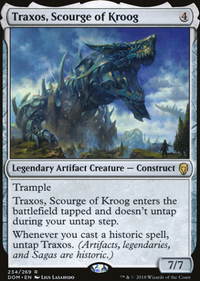 While you do have a ton of big bois, it can be difficult to get more than one of them out, and at least against the decks I've played against in the past, they can be quite vulnerable to creature hate. Having some smaller creatures to sacrifice or overwhelm your opponent with is never a bad idea. 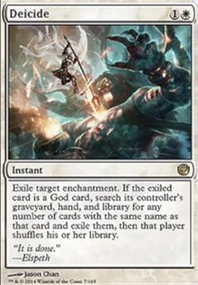 Some cards I would recommend include, Temple of the False God, Oblivion Sower, Kozilek, the Great Distortion, Sea Gate Wreckage, Pathrazer of Ulamog, Deceiver of Form, Spawning Bed, Homeward Path, and Unstable Obelisk. There's a few more I can think of but they don't come cheap such as Ugin, the Spirit Dragon, Karn, the Spirit Dragon, Ulamog, the Infinite Gyre.